There are bad guys, and there are scary, snarly, nightmare inducing guys. 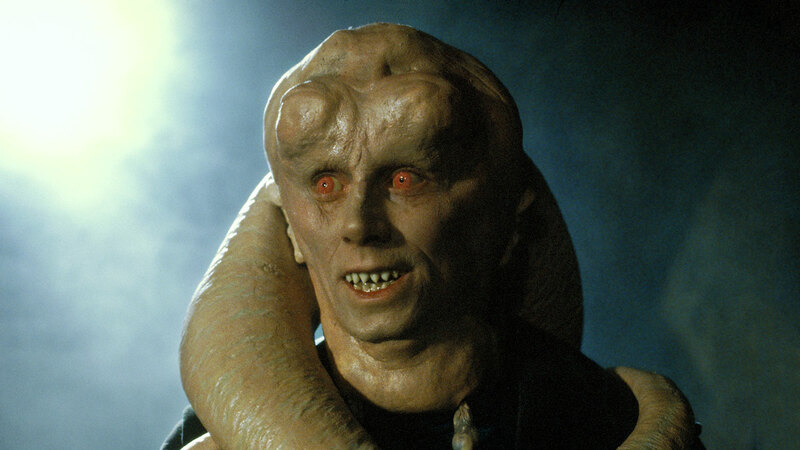 Bib Fortuna always gave me the creeps more than any other character…. I think even more than Darth Maul. This creates an interesting dilemma when making children’s clothing… On the one hand there is the opportunity to use a pun like Bib, on the other hand you don’t want to scar your young child for life. From StarWars.com © Lucas Film Ltd. 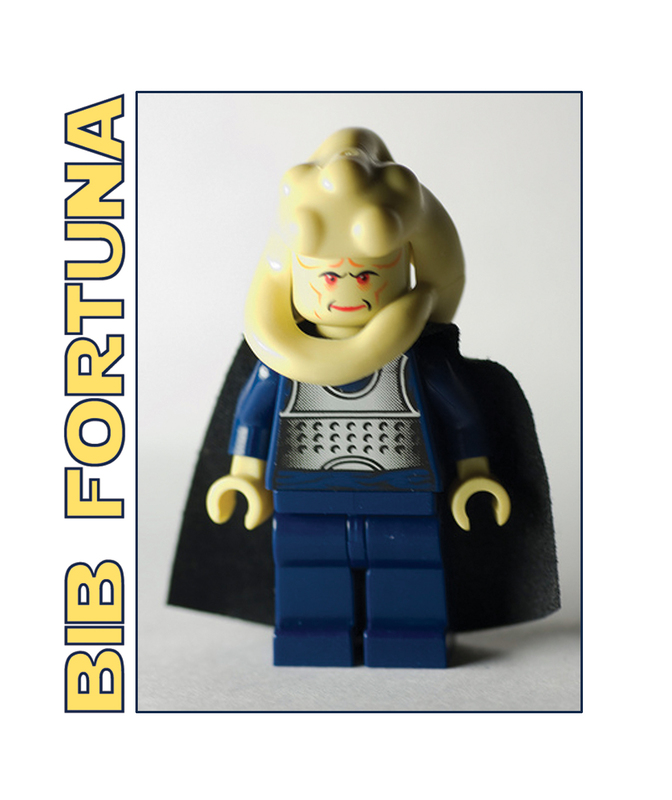 So after looking for a non-nightmarish image of Bib Fortuna online, M4P friend Amy, who was helping making the Bib, finally settled on the Lego mini fig version. Even the scariest of things look happy in Legos! (Everything is Awesome!) She made the Bib, and Fortunately, there were amused adults and smiling children abound. I don’t know the original source for the Lego mini fig picture. If you recognize it, please let me know and I will add a © and a link! As always, we ask you not to make and sell these. A, because Lucas Film Ltd. owns the rights to all Star Wars characters, and Lego owns the rights to the mini-fig; and B, because we made the design and it would be unfair for you to make money off them when we are sharing it with you for free. If you post your work made with our downloadables, please post “© Anette Nam Design” and the link “maythefourthbewithyouparty.com” along side the art. THANKS!! Flip the image and print out on transfer paper. Iron per instructions on the package. Make sure tell your young child how friendly and playful the image is. 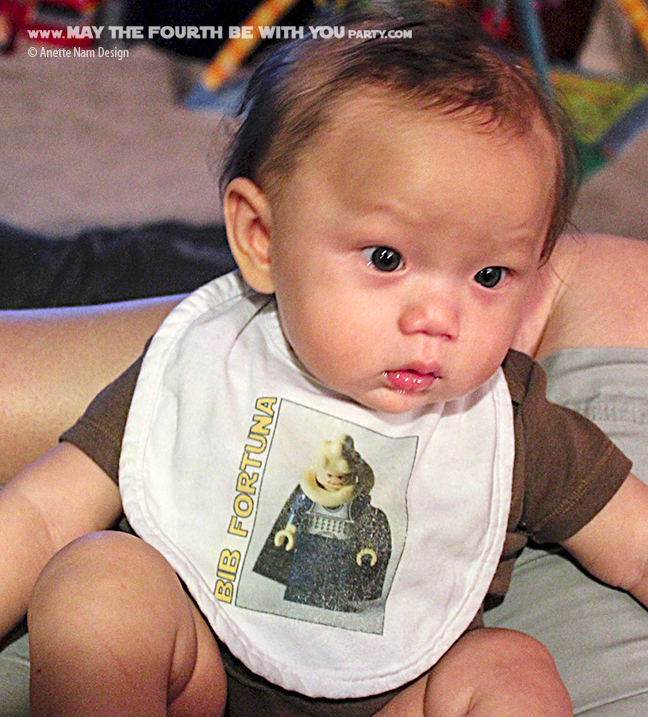 If your child is prone to eating his bib (trust me, it happens!) Keep a watchful eye, since I am guessing there is a lot of bad stuff in the iron transfer. An iron transfer is actually not that well suited for something that get really dirty and then washed A LOT. The picture at the top was taken after many washings, and you can tell the color is starting to fade – though some of it had probably been gnawed off….